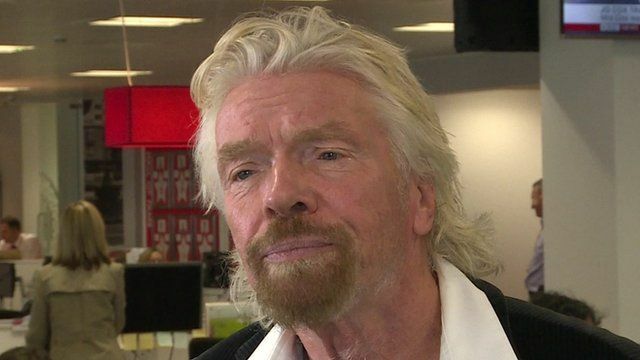 Branson 'fearful' over Brexit impact Jump to media player Sir Richard Branson tells the BBC why he is backing Remain in the EU referendum. Call for illegal immigrants amnesty Jump to media player Boris Johnson has urged supporters at a rally to "take back control" by voting for the UK to leave the EU in the forthcoming referendum. Gove insists UK better off outside of EU Jump to media player Michael Gove MP has told the Andrew Marr programme that a vote to leave the EU would give more control to the UK. Warsi attacks Leave 'lies' and 'xenophobia' Jump to media player Baroness Warsi says she switched sides in EU campaign because Leave became "divisive"
Sir Richard Branson has reiterated his support for the Remain campaign ahead of Thursday's EU referendum vote. The entrepreneur told the BBC's Andrew Verity that he is "very fearful" that the consequences of a UK exit from the European Union would be "catastrophic for Britain". And he explains why he believes that it's not just his business Virgin Group which will suffer, but the wider British economy.